There are two different types of Steel Scholarships. Applications for 2017-2018 will be accepted through 31 October 2016. Please read all information below before submitting the application. 1. 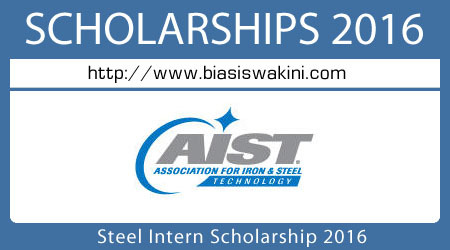 Steel Intern Scholarship – Summer internship followed by a US$6,000 one-year scholarship. These awards are preceded by a paid summer internship at a North American steel producing company or industry supplier. – Up to 20 one-year awards. – Premier Intern Scholarship – The top-scoring applicant of all received will be awarded the Premier Scholarship, a one-year scholarship of US$12,000 with a paid summer internship (summer preceding the scholarship). – Applicant must commit to a paid summer internship at a North American steel company or industry supplier and must be a citizen of the United States, Canada, or Mexico, or eligible for employment in a NAFTA country through a work permit. Note: Applicants are encouraged to seek information from steel companies at career/job events and may, at any time, accept an internship or co-op at a steel producing company or industry supplier. If an internship is self-placed by the recipient, the specific internship company will need to be approved. Please contact AIST prior to accepting a self-placed internship for approval. Acceptance of an internship at a company not specifically related to steel manufacturing will automatically disqualify the applicant. – The recipient will be disqualified if he/she rescinds an accepted offer of internship from within the program. – Applicant must receive a satisfactory performance review from the internship company, and maintain a 2.5 or higher GPA, to remain eligible for this scholarship. These awards do not include an internship. – Of the 13 scholarships offered without internships, some are named scholarships in honor of people in the steel industry who have made a significant contribution or achievement to steel technology. These awards will be assigned upon recipient selection. – Up to US$6,000 is offered for graduate students. – Students in the following engineering/engineering technology majors may apply: metallurgy, materials science, electrical, mechanical, chemical, industrial, environmental, computer science. – Applications will be accepted from university freshmen, sophomore and junior applicants. – Applicant must be enrolled full-time in a four-year undergraduate program at an accredited North American university. – Applicant should have a minimum cumulative GPA of 2.5 on a 4.0 scale. – Application, essay and recommendation letters should express a strong interest in the iron and steel industry. – By submitting one application, the student will be considered for all scholarships to which he/she meets the criteria, unless indicated otherwise. The application provides an option for internship or no internship. – Applicants will be automatically considered for a Steel Scholarship (no internship), if not selected for a Steel Intern Scholarship. 1. A current résumé with work experience and any extracurricular activities, noting any leadership positions. 2. An essay, not to exceed two pages in length, citing professional goals, explaining why the student is interested in a career in the steel industry, and discussing how your skills could be applied to enhance the industry. 3. Letters of recommendation from a professor or academic advisor familiar with your work and interest in the steel industry (minimum of two) and from an employer (optional, but recommended if the student has relevant industry work experience). Endorsement letters should be made to the attention of the AIST Foundation Scholarship Committee. Letters must be submitted directly to lwharrey@aist.org. 4. A current academic transcript or other official documentation of academic standing and performance. Official transcripts are not required. London : 2016 Malaysian Grand Prix caused hamilthon to miss the chance to clinch the world championship. Los Angeles : Bolt just focus 100m for 2017?